While previous 'security planning' in Bogotá has been premised on eviction and demolition, emerging redevelopment frameworks are geared toward a far more pervasive practice of urban renovation; the re-peopling of problem areas in the city. Security rationales have long featured in logics of urban planning in Latin America. Devastating battles have been fought over the seemingly innocuous and mechanistic task of reorganizing the urban fabric, its casualties rendered invisible by state rhetoric of order, development, and democracy. But the targets and tactics of urban security are continually shifting, its legitimacy repeatedly called into question in cities across Latin America, where projects of spatial transformation are frequently confronted by competing claims for urban safety and social justice. 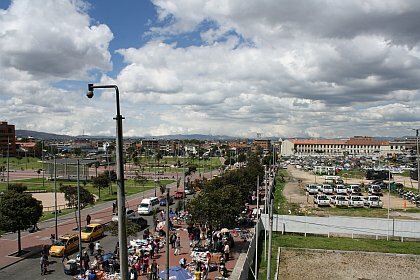 In the late 1990s, Bogotá became the site of a war against crime and incivility waged in part through the reconstruction of urban space. The city administrations of Antanas Mockus (1995-1997; 2001-2003) and Enrique Peñalosa (1998-2000) advanced a series of policies aimed at eradicating ‘disorder’ through the production and recovery of public space. Attempts to rebuild the public sphere during this period often translated into tactics of removal and control, which, paradoxically, undercut the broader democratic ideals for which these administrations became widely renowned. An exclusionary politics, it seemed, was intrinsic to assembling the ‘publics’ for whom ‘public space’ was being produced. In more recent years, a shift has been gradually taking place in Bogotá: from the ideology of spatial reconstruction to a far more pervasive discourse of urban renovation. Whereas the ‘urban security’ of previous years was premised on the emptying out of problem areas, contemporary redevelopment frameworks are geared more toward urban repopulation and reactivation. The struggles over Bogotá’s emergent renovation plans evince the tense articulations between projects to secure and projects to democratize urban space. Although discourses of social justice have permeated Bogotá’s urban policy frameworks since the 1990s, debates over urban inclusion have become particularly central in the city’s present juncture. The election of city mayor Gustavo Petro (2012-2015) –a former M-19 guerrilla militant and leftist politician– is exemplary of this political moment. Significantly, redevelopment policies are now a key component of Petro’s agenda. Relabeled as ‘urban revitalization’ by his administration, the planned repopulation and densification of the inner city is presented not only as a means to revert urban decline, but also as a path towards socio-spatial inclusion. The implications of such rebranding efforts under Petro are ambiguous, such moves could either enforce more subtle and opaque tactics of urban discipline and displacement in the city, or open up new spaces for political contestation and urban inclusion. The city’s undeclared state of emergency of the 1990s brought about a form of crisis planning in which spatial violence became increasingly overt. The emblematic project aimed at securing Bogotá during this period was the demolition of El Cartucho –a bustling hub of illegality and marginality located in the Santa Inés neighborhood in the heart of downtown Bogotá. Between 1999 and 2005 twenty blocks were razed for the construction of the Parque Tercer Milenio or Third Millennium Park: a monumental space to mark the city’s entrance into the 21st century. Carrera Décima in the 1960s from south to north. Saúl Orduz. Instituto Distrital de Patrimonio Cultural - Colección Museo de Bogotá. All rights reserved. Santa Inés was one of neighborhoods that had been cut off from the city center by the modernist thoroughfare. 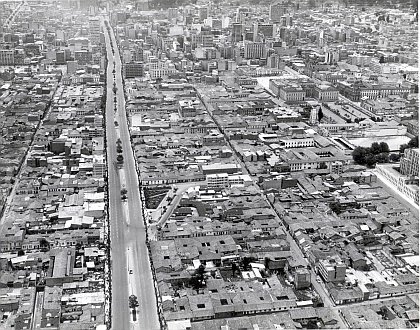 State (in)action transformed the neighborhood into a ‘residual space’ that rapidly declined and eventually became known as El Cartucho. By the 1980s the neighborhood was not only a refuge for impoverished migrants, tenement dwellers, and street vendors, but also the site of a powerful illegal drug market controlled by local mafias[ii]. The militarized construction of Third Millennium was ultimately a demonstration of sovereignty aimed at recapturing urban space from criminal gangs; the scores of marginalized urban dwellers that the operation displaced were merely ‘collateral damage’ in battle for spatial control of the area. Today, the use of the park is fairly stratified: bazuco (crack cocaine) smokers and street vendors are confined to the edges, while more ‘disciplined’ users visit inside. The park is a buffer zone between the more prestigious districts of east downtown and the ‘unruly’ surroundings to which El Cartucho’s criminal activities relocated. The residential neighborhood of San Bernardo, to the south, became home to El Cartuchito, a smaller version of the original olla (drug market). The infamous olla of El Bronx, to the west, grew considerably and is now in the front line of Bogotá’s urban conflicts. The San Victorino redevelopment site, as of 2012 being used as a parking lot for police vehicles. Federico Pérez. On the north side of the park, four hectares of the original twenty that were demolished remain vacant. Originally envisioned as an open-air mall, the San Victorino project has been on hold for years due to mismanagement and under suspicions of corruption. 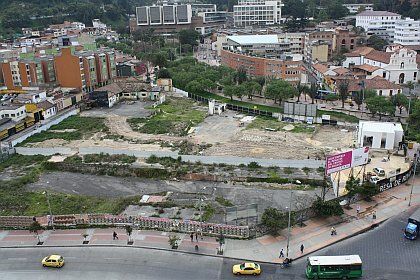 This faltering intervention is emblematic of Bogotá’s most recent redevelopment struggles. The city administration is currently involved in a contentious move to devote part of the land for the construction of social housing. The question is no longer how to design destruction[iii]; but rather how to populate space. Here, as in other renovation projects in the inner city, the tensions between security, profitmaking, and inclusion are more acute than ever. "Aquí se renueva el centro de la ciudad" [The city center is renovating here], San Victorino, 2012. Federico Pérez. In contrast to Third Millennium, recent renovation plans such as the Block 5 project aim to open highly profitable real estate markets in places where the notions of ‘decay’ are strongly contested. For Paulina and Enrique, two community leaders affected by another downtown renewal plan–Central Station– a politics of ‘decline’ had been mobilized to displace residents for the profits of redevelopment. For them, ‘insecurity’ and ‘decay’ had to be dealt with by the police and judiciary and not through eviction and renovation. The Block 5 and Central Station projects, and the multiple private development plans that followed, sought to redevelop land for mixed uses, in contrast to the public space centered paradigm of previous years. Security was now less about terrain and more about activities and population. Such plans, however, also bore continuities with earlier interventions in their attempts to erase and fully reinvent spaces and their inhabitants. Securing and recovering the city was to be accomplished not through the violence of spatial emptiness but through the force of radical redevelopment. This wave of urban renovation peaked between 2007 and 2009 but soon died out. Displacing local inhabitants to remake spaces exclusively for new capital and new people quickly became politically and socially untenable. Urban renovation had to come to terms with mounting claims for inclusion. A new approach confronting these challenges has begun to take shape since 2010, when a private university, acting as developer, took the first steps in rethinking urban renovation. 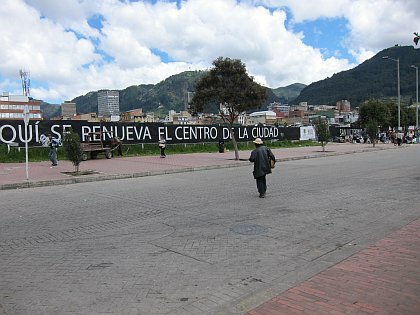 During the past two years the Universidad de los Andes has promoted a participatory redevelopment plan known as Fenicia Progresses in the east side of downtown Bogotá, next to the Block 5 project. The university has focused its efforts on building a partnership with property owners and residents with the aim of avoiding displacement and redistributing the benefits of urban renovation. The plan relies on the voluntary association of local actors who can become redevelopment partners by contributing their land. Although not without opposition, the Fenicia Progresses plan was submitted to city authorities in late 2012 and is currently under study. 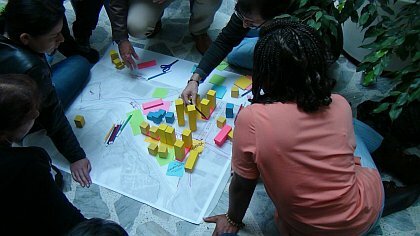 Participatory urban design workshop, Fenicia Progresses Plan - Las Aguas neighborhood, 2012. Federico Pérez. 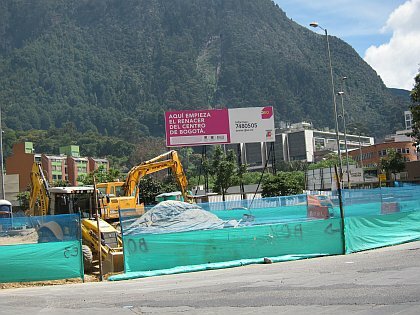 During the past year, the recently elected administration of Gustavo Petro has attempted to redirect the city’s renovation policies along these same lines. In what could be described as an associative turn, the administration’s ‘revitalization’ policies now emphasize participation and inclusion. One of the government’s key policies is the densification of the inner city and, in particular, the production of low-income housing in central districts. Current attempts to restructure plans that were formulated by previous administrations –such as San Victorino, Block 5, and Central Station– now seek to include local residents, diminish the projects’ profit-driven character, and increase the overall offer of accessible housing. Although their future is uncertain, Bogotá’s emergent renovation frameworks strive to connect concerns for security, development, and inclusion. Redevelopment appears here less as a matter of spatially displacing violent conflict and ‘urban decay’, and more about reverting it from within through more complex forms of managing spaces and people. While apparently carving out promising political openings to address the city’s deep-seated patterns of inequality, these new conceptions of urban revitalization are nonetheless compelled to contend with market forces and to rely on an individualistic ethos. Partnership schemes, and what are still only elusive associations, are primarily open to propertied and self-reliant individuals, who are willing to remake themselves into real estate and development entrepreneurs. In the absence of clear state sanctioned rights, capable institutions, or strong forms of cooperation that can offset market-driven inequalities, it may well be that urban citizens will unwittingly contribute to their own displacement by participating in the construction of an exclusive city. [i]Revista Proa no. 13, “Reconstrucción de Bogotá,” Junio, 1948. [ii]For more on the history of El Cartucho see: Ingrid Morris, En un lugar llamado El Cartucho: crónica (Bogotá : Alcaldía Mayor de Bogotá, 2011). [iii]Eyal Weizman and Phil Misselwitz, “Military Operations as Urban Planning,” Mute Magazine, August 2003.